The project involves people from 16 of a total of 18 Departments of the University of Pavia: it is important to notice that, despite the scientific subject, project applications and outcomes are topic of great interest also for researchers coming from humanities. Actually, 3D printing and additive manufacturing are expected to have a great impact on the industrial production systems and on the job market in the following years. In the following scheme we present UniPV departments contribution to the five main pillars. 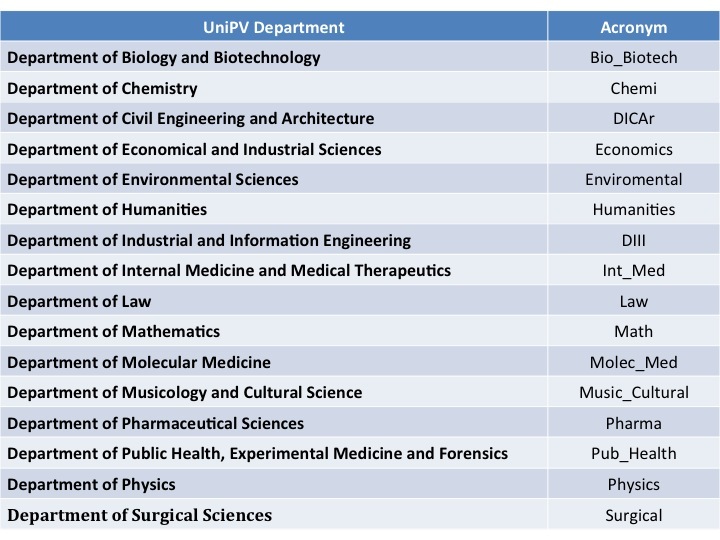 Here below are listed all the UniPV Departments involved in the project and the number of people that have expressed their interest into the project and will give their contribution. Many of them are already working on research topics related to the project activities. To date a total of 67 people are involved in the 3D@UniPV project. For more details, visit the People page. Development of a method of prototyping of vascular models in silicone. The collaboration includes the print materials test for the production of plastic molds degradable in the solutions that do not alter the silicone, to facilitate the extraction process. Use of 3d Printer to realize architectural and urban model at small-scale, allowing also the replicability. This may represent an evolution of the architectural design tools, as has been the advent of three-dimensional modeling programs. Experimentation and innovation in the field of architectural construction of building structures: radical change in the construction procedure and in the management of the construction site through the production of building components to be assembled for parts or the realization of the entire building. This application has obvious positive effect in terms of sustainable design (zero waste, reduced transport costs, logics of disassembly of constructions with reuse of materials that can be melted or recycled, research on new materials) and building maintenance. Pavia2020 and future industrial scenery, local and global manufacturing. New frontiers outsourcing of the primary activities. 3D for rapid prototyping, especially in support of SMEs / startup (but not only). Role of FabLab in the eco-systems of innovation. Models of economic and financial sustainability and revenue models. Reflection cognitive, epistemological and ethical on the subject of rapid prototyping, and especially of 3D printing. Realization of prototypes of human carotid in silicone for in vitro testing of laser measurements of the vascular wall deformation. Modelling, prototyping and archiving of models of 3D shapes, aimed at developing limb prostheses and custom shapes for the construction of footwear. Analysis of patent and industrial rights applied to the development of technologies and products made with rapid prototyping. Development and analysis of models and methods for the simulation of thermo-mechanical behavior of materials (both standard and advanced) and structures. 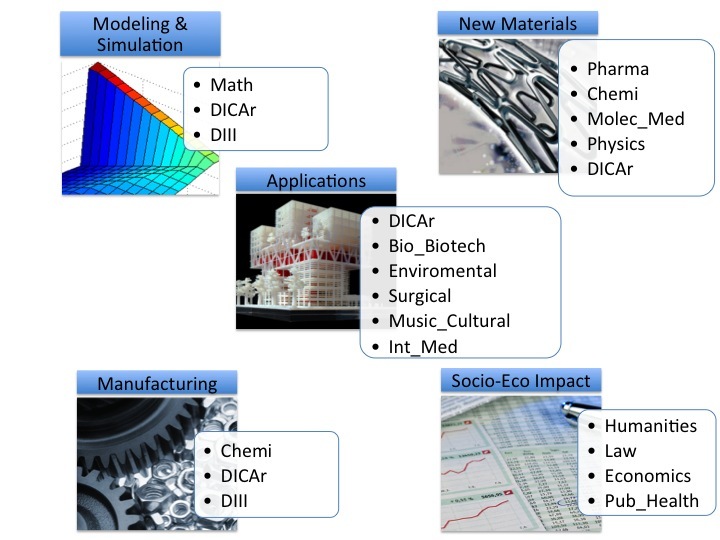 The Department of Civil Engineering and Architecture and the Department of Mathematics have a well-established collaboration on these themes, proved by numerous studies published on international journals. Design and development of 3D multifunctional scaffolds using polymeric or other type materials. This scaffolds are enriched by nanoparticles that load growth factors for the creation of supports for the realization of the co-cultures of mesenchymal stem cells isolated from various tissues, for the study of bone remodeling and musculoskeletal systems in the absence of gravity and in the presence of simulated microgravity. Development of reconstruction models of the ancient cities to improve the research in historical and philosophical field with also archaeological exhibition purposes. Possibility use of 3D printing in the study, preservation and exhibition of the works of art. Realization of architectural structures, three-dimensional decorations and frames for the installation of exhibitions. Integration of the missing parts in the sculptural and architectural restoration. Construction of replacement copies 1 to 1 of sculptures located in open areas for which you need a shelter in a museum for conservation purposes. Design and development of in vitro experimental models to test drug delivery systems, 3D cell culture systems. The project aims at optimize of in vitro experimental models for the 3D cell culture, designed to test the activity of drugs and related therapeutic systems. Design and development of polymeric scaffolds for tissue regeneration with a focus on biodegradable and biocompatible polymers. The project develops skills of the research group in the field of therapeutic systems and polymeric design. This group will work on the design and the physical, chemical and biological characterization of the scaffolds. Prevention of risks related to the use of nanomaterials for the general population and employment. Prototyping of bioscaffold for the cultivation of tumor cells with vasculature. the aim is the replacement of the current model animal or restrict its use, according to the recommendations of the recent decree. Applications for biodistribution and efficacy studies of new anticancer drugs and / or vectors of the boron in the case of BNCT. Realization of 3D scaffolds for cell culture is a preliminary step to the interesting line of research that attempts to create organs or bio-engineered tissue using polymer matrices and the patient’s cells (Prof. Franco Benazzo: prosthetic materials made with this technology).